Rice Rose attorney Paul Rice is seen here competing in the 7th Annual Tri Y Triathlon. 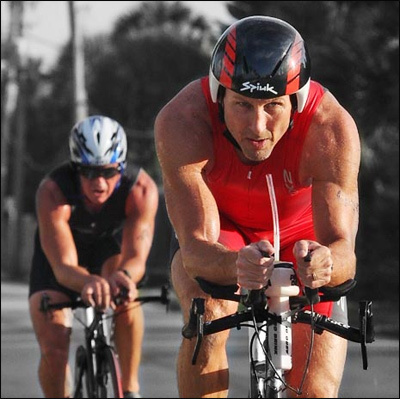 Rice & Rose attorney, Paul Rice, seen here competing on the bike portion of the race, was the overall winner of the Seventh Annual Tri Y Triathlon held on May 30, 2010, in Ormond Beach, Florida. Rice bested a field of 300 athletes in this sprint triathlon consisting of a 1/4 mile ocean swim, 10 mile bike and 3 mile run. The staff at the Ormond Beach YMCA puts on the race which is sponsored primarily by Stoneood Restaurants. Proceeds from the race go to the YMCA's Strong Kids Program which provides scholarships to underprivileged children to attend summer camp and after-school programs. To review the complete results of the 2010 Tri Y Triathlon, link to http://www.altavistasports.com/results/2010results/triytriathlon05302010.htm.